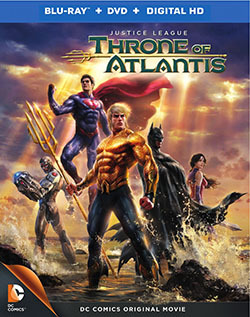 Justice League: Throne of Atlantis was released on DVD and Blu-Ray yesterday. I hadn’t even remembered that Aquaman hadn’t been part of the League before. If you haven’t seen it and don’t want to ruin the story, don’t read below. I would definitely check it out though. We start off with a submarine being attacked underwear by a bunch of “sea people” who destroy it. This gets Steve Trevor involved. (For some reason, he has a goatee. Not that I’m one to complain about facial hair.) He shows up to the base for the Super Seven. (Oops! Guess no one told the builders that they changed it to Justice League the week before! Cute moment there.) The only person on hand is Cyborg who walks down (yes, walks) and checks out the wreckage where he’s attacked as well. Time to call in the League. Superman and Diana are off on a date after already having been shown making out about a minute after you first see them. Once everyone is together, Cyborg uses his hologram ability that can somehow display everything that has been around him. (Really!? That’s more like cheesy cartoon animation, not something of the quality this should be.) The find out it’s Atlantans though and decide to investigate. Meanwhile, we find Arther drunk following his father’s funeral. He’s sitting in the bar and ends up in a fight when he tries to save a lobster (that he tells the guy) that he’s been talking to. Not the best way to sound sane. So, the guy who wanted to eat the lobster an a couple others attack Arthur and get their asses handed to them for obvious reasons. I’m still not sure how a knife managed to shatter against his chest though. He’s not indestructible like Superman. He gets tracked down by a scientist as well as Mera. When a troop of Atlanteans try to kill Arthur, Mera saves him and tells him the truth about his parentage. It turns out that his mother is now queen since the king is dead. Mera also gets him dressed up in the armor the king used to wear which leads to his standard orange and green costume. Back in Atlantis, Orn (Ocean Master) and Black Manta plot to take things over. This is a plot that leads Orn to kill his mother and blame it on the surface dwellers (just like be blames everything else). With his mother out of the way, Orn starts attacking the surface world. Arthur and Mera work with the Justice League to take on the threat. During the battle, we have a couple great moments. First, after Black Manta reveals he was behind Orn’s betrayal, Arthur calls a giant shark to pop up and takes Black Manta to make a snack of him. Arthur’s response to it? “Outrageous.” This is a great homage to the Aquaman character in Batman: The Brave and the Bold cartoon. It was said simply in the movie instead of with the emphasis of the cartoon, but it was still a good laugh. Second, while Superman is fighting Atlanteans, he run across a black guy named John Henry with a big metal sledge hammer. Looks like we’ve seen the start of Steel too. The League stops the war by having Cyborg use his built in 3D movie projector to show all the Atlanteans a clip of Orn admitting to killing the queen himself. Arthur takes over and the everything goes back to normal. Afterwards, the League visits Arthur in Atlantis. While there, the team decided that they need to stick together more and use the base and work as a team to stop stuff like this more. They also decide to recruit Arthur but think he needs a codename. Green Lantern mentions the media is calling him Aquaman. Arthur says he hates it so that becomes his name. There are a number of bonus features on the disk. The guys at DC decided they wanted to start adding shorts again so they add a REALLY short short of Nightwing and Robin fighting Scarecrow and his goons which is a branch off from the scene where Green Lantern goes to get Batman when he didn’t show up for the big team up at the beginning. The few minute battle is really nothing special. There’s a clip talking about the Batman vs. Robin feature that will be coming out and one about Ocean Master and Black Manta’s history in the comics. There are also a number of “rerun” cartoons like a couple of the Batman: The Brave and the Bold episodes relating to Aquaman, one of the old Filmation Aquaman cartoons, and (for some unknown reason) the Justice League Unlimited featuring the Legion of Super-Heroes that has nothing to do with Aquaman. It was a really enjoyable movie and I’d say that the disk is definitely worth picking up. Check it out and let me know what you think.